by Gary Chapman & Ross Campbell, M.D. Do you sometimes you feel that you are just not getting through to your child? Does your child seem to speak a different language? Sometimes they wager for your attention, and other times they ignore you completely. Sometimes they are filled with gratitude and affection, and other times they seem totally indifferent. Everything depends on the love relationship between you and your child. When children feel loved, they do their best. But how can you make sure your child feels loved? Since 1992, Dr. Gary Chapman’s best-selling book The Five Love Languages has helped more than 300,000 couples develop stronger, more fulfilling relationships by teaching them to speak each others love language. 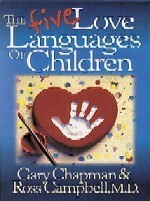 Each child, too, expresses and receives love through one of five different communication styles. And your love language may be totally different from that of your child. While you are doing all you can to show your child love, he may be hearing it as something completely opposite. I often don’t have time to sit and read a book, but I can listen to it while I’m driving or cleaning or washing dishes. With this audio book, you can now gain some insights in dealing with your children in order to get proper responses and cooperation from them. It may even help you to get them to do their school work more peacefully! What are the five love languages, you ask? Learn to meet your childs deepest emotional needs. This audio book will help you.